Radiographs, or X-rays, are one of the most common and useful diagnostic tools in medicine because of their ability to penetrate tissues and show your pet's organs and bones. 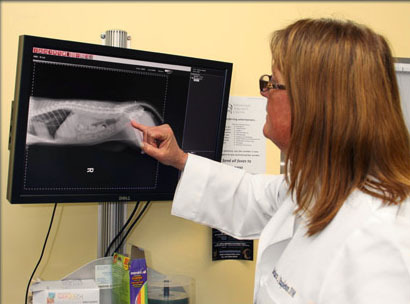 At Barrington Animal Hospital, we use X-rays to examine your pet's bones, lungs, heart, abdomen, oral cavity, and other areas, and for diagnosing and monitoring many medical and surgical conditions. If we suspect your pet has a fractured bone, has swallowed a foreign object, or is suffering from a heart problem, an X-ray can tell us what we need to know. The clear, detailed images can be manipulated so we can get a better view of your pet's bones and internal organs, leading to a quicker and more accurate diagnosis. Ultrasound is a painless, safe, non-invasive procedure that we use to evaluate your pet's internal organs. It is one of the many ways we strive to give you peace of mind when it comes to your pet's health. Using sound waves, ultrasound produces a real-time moving picture of your pet's organs that allows us to visualize objects that cannot be detected by X-rays alone. At Barrington Animal Hospital, we use an ultrasound service provider to assess the shape, size, tissue density, internal structure, and position of your pet's abdominal organs, assess cardiac health (also called an echocardiogram) and diagnose pregnancy. It can also be used to identify masses or tumors and as a guide during surgical biopsies. We believe ultrasound is best performed by professionals who are specifically trained in its use and then the results read by a board certified radiologist or cardiologist. The ultrasound procedure takes between 30 to 60 minutes to perform and, unless it is being used during a surgical biopsy, does not typically require sedation. A diagnosis based on what we see is usually available immediately, which means we can also provide you with treatment options at the time of your appointment and minimize your worry and stress. Ultrasound is a painless, safe, non-invasive procedure that we use to evaluate your pet's internal organs. It is one of the many ways we strive to give you peace of mind when it comes to your pet's health. Using sound waves, ultrasound produces a real-time moving picture of your pet's organs that allows us to visualize objects that cannot be detected by X-rays alone. One of the most important uses for ultrasound technology is to observe your pet's abdominal organs, including the liver, stomach, spleen, pancreas, intestines, kidneys, bladder, uterus and prostate. The images produced allow our specially-trained veterinarians to assess the shape size, tissue density, internal structure, and position of your pet's abdominal organs, as well as identify masses, tumors, and abnormal lymph nodes. The procedure can take between 30 to 60 minutes to perform and, unless it is being used during a surgical biopsy, does not typically require sedation. A diagnosis based on what we see is usually available immediately, which mean we can also provide you with treatment options at the time of your appointment and minimize your worry and stress. 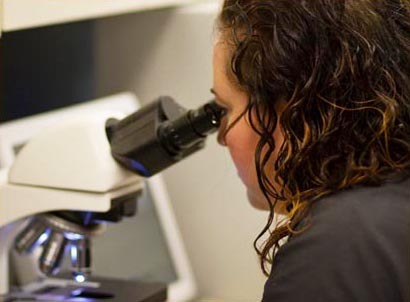 Because protecting your pet's health is our most important job, we have a complete in-house diagnostic laboratory that allows us to perform a wide range of tests on blood, urine, feces and biopsied tissue. Without timely access to these precise test results, it would be difficult to make an accurate diagnosis or assessment of your pet's health. Test results can also help us in the early detection of diseases and other conditions affecting your pet's health and well-being. For example, diagnostic testing can detect heartworm disease, Lyme disease, infections, feline leukemia, intestinal parasites, urinary tract infections and many additional diseases and conditions that can go unnoticed in their early stages. Early blood testing can show evidence of diabetes, changes in liver or kidney function, or simply provide a baseline for future reference. Diagnostic laboratory testing is also completed prior to dental or surgical procedures that require general anesthesia. Laboratory testing provides information about your pet's overall systemic health without the need for invasive and expensive procedures. Thanks to our in-house diagnostic laboratory, we are able to deliver your pet's test results quickly - often within a few minutes - minimizing the time you need to wait for an accurate diagnosis and treatment plan. For more information about Barrington Animal Hospital's diagnostic services or any of our veterinary services, please email or call us at (847) 381-4100. We are always happy to answer any of your questions or concerns.